I was driving around aimlessly on Friday and decided to go down 288 to see Eclectic Menagerie Park. I have written about this place before--a strange sculpture garden off the freeway at Belfort, created by Texas Pipe and Supply, a major pipe distribution company. I complained that the company's site didn't identify the artists, but that has been partially corrected. A burly bearded fellow named Ron Lee made a few of the sculptures there. The style is roadside kitsch, but that genre admits certain modernist tropes, as can be seen in the saluting man on the right and the column in the center. 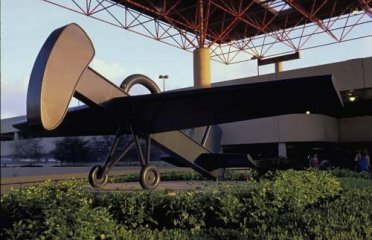 There's a pretty thin line between this stuff and the sculpture of, say, Jim Love (whose plane sculpture Call Ernie is quite close to Eclectic Menagerie Park at Hobby Airport). I don't think parsing a distinction between "high art" or serious art and the kind of art at Eclectic Menagerie Park is very important. Particularly if such a distinction keeps me from enjoying Eclectic Menagerie. This place exists, it's fun, and it makes the drive down 288 a little less bleak.